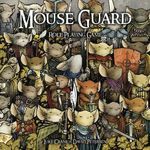 Join the Mouse Guard and defend the Mouse Territories against predators and dangers, in this roleplaying game for the Mouse Guard comic book series! The game is intended for all ages and levels of game-playing experience by award-winning game designer Luke Crane and is based on a simplified version of his Burning Wheel rules system. This system is designed to provide a rich yet structured approach to creating a shared narrative adventure. Game sessions are divided into two main parts, the Game Masters Turn, and the Players Turn. In both Turns the game story can change and evolve. The system is designed to encourage story telling, particularly shared story telling, with both players and the GM at times alternating control of the narrative. While the rules differ from the traditional pattern of pen and paper RPGs, the rules are easy to follow and well laid out. Archaia Studios Press have created a beautiful book, with luxurious full color pages heavily illustrated with images from the comics, and new drawings by Mouse Guard creator David Petersen. A personal attempt to understand how to help players navigate the game grew into this set of guidelines. So, I decided to format and share it. At RinCon '09, I ran a game of MG and had the players wear buttons depicting their mice. This file has three copies of each of the four mice: one with the names of the mice in my game and two blanks for you to use in yours. The drawings are all original and based off of David Petersen's artwork. 58 Mouse Guard Character Sheets Etc. A scenario for 3-4 PCs of Mouse Guard. Review of the \'\'Mouse Guard\'\' roleplaying game. A parody of the Mouse Guard setting.